A brief report by local students on the history of the parish and some pictures of the parish can be found at this link. The parish was incorporated as Christ's Church in 1793, and while "Christ's Church" is the parish's official name, many people have referred to the parish over the years as "Christ Church," or as "Christ Episcopal Church," or "Christ Church (Episcopal)." The former Dean of Trinity School for Ministry (an Episcopal seminary) has noted that Christ Episcopal Church is the least altered pre-Tractarian Episcopal Church in New York State. The parish was consecrated in 1793 by Bishop Samuel Provoost, one of the three original American bishops of the Episcopal Church and who was consecrated bishop in 1787; he was the first Bishop of New York and Rector of Trinity Wall Street in New York City. James Duane, a federal judge, was one of the wardens at Trinity Church, and John Jay, a Supreme Court Judge, was the other warden at the time. 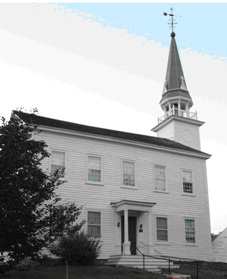 The church building, which James Duane paid to have built, is on the National Historical Register. The edition of the Book of Common Prayer at the time of the consecration was the 1789 version. James Duane represented the Diocese of New York at General Convention; he was also the first Mayor of New York City after the American Revolution, at the time when New York City was the capital of New York State and the capital of the United States of America, and he owned the land which is now called Gramercy Park. A local historian has noted that James Duane, who founded the town of Duanesburg, proposed to make Duanesburg the Capital of New York State, prior to the selection of Albany (which officially became the capital in 1797). Not only was Christ's Church to have been at the center of the town of Duanesburg, but it would also have been at the center of the capital city of New York State, literally. Mr. Duane is associated with the drawing up of the Articles of Confederation (a document drawn up between the Declaration of Independence and the U. S. Constitution), and with the proposal for the formation of the Continental Army. Mr. Duane married Mary Livingston, of the famous and politically connected Livingston family of New York. Her uncle (Robert) was on the committee that drafted the Declaration of Independence, but it was her grandfather (Philip) who actually signed it on behalf of New York. The Livingston family had been involved with the founding of the Whig Club in New York. One of James Duane's daughters, Mary, married General William North, who lived in Duanesburg and who was a warden of the parish. A picture of their house and its history can be found at this site. Mr. North was an aide to Baron Steuben during the Revolutionary War and was involved with the development and naming of the Town of Esperance and with the State Legislature enabling the building of U.S. Route 20 from Duanesburg to the West. Baron Steuben was the equivalent to George Washington's Chief of Staff during the Revolutionary War, and William North was one of two people to handle his estate upon Steuben's death. William North also wrote a biography of Steuben. 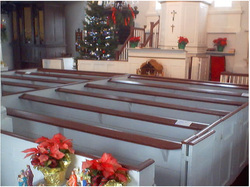 James Duane, his wife Mary Livingston, William North and his wife Mary (Duane) North are buried underneath the church. 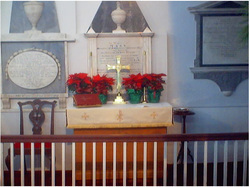 Memorial plaques to each are also in the church. Another of James Duane's daughters, Sarah, married George Featherstonhaugh, who lived on Lake Road in Duanesburg, was a warden of Christ's Church, and later became the first U. S. Geologist. He also came up with the idea of founding the Mohawk and Hudson Railroad which started service in 1831. Later in life, Mr. Featherstonhaugh enabled King Louise Philippe of France and Queen Marie to escape to England. In 1824, a Gazetteer noted that Mr. Featherstonhaugh's house was said to have one of the best views in New York State, according to this (under "Duanesburgh"). In 1826, Thomas Cole, a founder of the Hudson River School of Painting, was hired by Mr. Featherstonhaugh to paint pictures of his property and house in Duanesburg. Two of these paintings can be found online : here and here. A book about George Featherstonhaugh has been written by Edmund Berkeley and Dorothy Smith Berkeley, entitled George William Featherstonhaugh, the First U. S. Geologist. Mr. Featherstonhaugh wrote two journals that can be read on line, "Excursion through the Slave States", and "Canoe Voyage up the Minnay Sotor" with depictions of people, life, and cities along the way in the Ante-bellum United States.